Emma had to be given up due to a valid moving situation. She is an adorable, easy going, friendly little lap dog that loves everyone and everything. She is also very good with cats, kids, other dogs. Update from foster home – Let me gush about Emma……cause she is something else. Emma is doing great. She loves to be on your lap or at the very least right at your feet warming them up. She integrated with our current dogs no problem whatsoever. 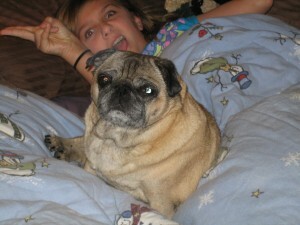 They were afraid of her because of her very loud Puggy Noises! But now they all sleep together. She is not dominant at all, and the best housetrained dog in my home currently. She is glued to my daughter. They fell in love at first site across the Petsmart parking lot! Emma likes to watch tv – which is something my dogs don’t do, so that has been fun. She loves to quietly bark at other dogs on tv. Emma also likes to howl when my daughter sings – she joins in the fun. She is a fantastic girl, there isn’t one thing I would change about her. She is just Emma. Not one little tiny issue have i noticed with Miss Emma. She is the best.